“I want to make this place a place of pilgrimage, a place of grace…..” said Father Kentenich on October 18, 1914. The question is not unnecessary: And, what is grace? Grace is the gift which God our Father gives to us His adopted children as He demonstrates to us his merciful love in Christ His Son. Grace is being in communion with the Living God, it is participating in the divine life by truly being temples of the Holy Spirit. Grace is also the help we receive from God which makes us capable of fulfilling well our duties according to our state of life, of fulfilling our personal mission daily. The Schoenstatt Shrine is a place of grace because the Blessed Virgin Mary has wanted to attach herself there in a special way. There, She who is “full of grace” makes herself present. She is there to lead us to Christ her Son….. to intercede the Holy Spirit for us…..to root us in the Father….. to bring us closer to all people, our brothers and sisters. …. to help us have a reencounter with our own selves, with myself, in coming to grips with my personal self with its clarity and darkness in openness to God’s love for me, in openness to his merciful and faithful love. She is there to help us live the mystery of the Church. This reality cannot be fully transmitted with words. One must live it, one must grasp it vitally. If this does not take place, it may seem that I like many things about Schoenstatt, but I will not have crossed its threshold and penetrated its mystery. “All who come here to pray must experience the glory of Mary,” we read in the Founding Document. As the years pass, the secular mission of Fr. Kentenich is better understood. He is the promoter, the witness and herald of the presence of the Blessed Virgin Mary in a concrete place, The Schoenstatt Shrine. Let us recall one of his testimonies in 1939. The Second World War had begun. By circumstance, Father Kentenich was in Switzerland. On the occasion of the 25th anniversary of the founding of the Movement, he writes a letter to Schoenstatt. Upon reviewing the past 25 years, he affirms: “All that is great and valuable which we have received during this time in this holy place is intimately connected with the Mother, Lady and Queen of Schoenstatt. Simply put, She is the gift which the wise and good divine omnipotence has wanted to give in a special way on October 18, 1914, to our Family and through its intercession to the entire world anew” (October 18, 1939). The “soul” of Schoenstatt lies in the mystery of the presence and activity of the Virgin Mary in the Shrine. Mary is full of grace (“Hail, favored one! The Lord is with you,” was the greeting from the angel Gabriel – Lk 1,28). She is also, according to the constant experience and doctrine of the Church, Mediatrix of all graces. 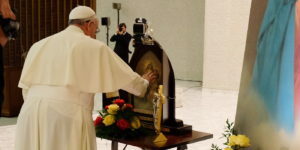 Who could fully understand the graces that She, Mother of God, Mother of the Church and Mother of mankind, has dispensed in the Shrine, in the Schoenstatt Shrines scattered throughout our country and the world? We are facing something mysterious and at the same time fascinating, the mystery of Mary’s love for us, the mystery of her universal maternity. If normally a child never fully understands what his mother has done for him, how much more is the relationship with Our Heavenly Mother! Schoenstatt speaks of the three graces which the pilgrim receives there, or of three “graces of pilgrimage;” a home – or being rooted – spiritually; interior transformation and apostolic fruitfulness. How were they discovered? Who defined them and when? The answer is in the following: in the first place, Schoenstatt is not an ascetical or pedagogical system or an ideological movement, but rather an historical event, a vital process from which a current, a movement of life has come forth. A comparison: How do we know which type of thermal baths is best for curing this or that ache? As time goes on, the experience proves which aches or illnesses benefit from which thermal baths. In a similar way, as time went on, experience showed which special graces were granted by the Virgin Mary from her Schoenstatt Shrine. We will explain each one.